Members of Greenpoint Post, No. 241, American Legion, Corporal T. Raymond Nulty Post, Veterans of Foreign Wars and relatives and other friends will take part in funeral services for Pvt. 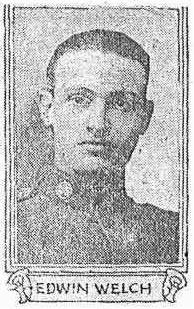 Edwin Welch Jr. of Co. E, 302d Engineers, whose body is to be brought to his home at 638 Leonard street, Greenpoint, tomorrow. Pvt. Welch was killed at Remille, Prance, on Armistice Day, Nov. 11. 19I8. His body was brought to-America on the transport Somme. The funeral has been set for Saturday, March 26, in order to make It possible for Mrs. John Hall of Kirby, Mont., a sister of, the dead soldier, to get to Brooklyn from her home. Pvt. Welch was a member of the first National Army contingent to leave Greenpoint for Camp Upton in September 1917. Ho sailed for France on Good Friday, 1918. His unit served in the campaigning at Chateu Thierry, in the Argonne and along the Vesle. On Nov. 10 Pvt. Welch and seven other men were detailed to make repairs to a bridge across the Meuse. They worked under shellfire and late that night completed their work and went to a cottage in Remille to sleep. He stepped out On the threshold as a shell burst nearby and a number of fragments pierced his body. He was buried In the gardens of the cottage. Later his body was disinterred and placed in another cemetery. Pvt. Welch Left a baby boy he had never seen. The child. Edwin Welch 3rd was born six Months after its father went overseas. He is also survived by his wife. Mrs. Emily Welch; his parents, Edwin and Anna Welch. And five sisters, Mrs. Fred Raddatz. Boro Treasurer of the League of Women Voters; Mrs. John Hall. Mrs. William Decker Mrs. Charles Herold and Mrs. J. Deforrest. Greenpoint Post has completed its membership drive inaugurated April 14 last, and has secured 100 new members. The post at present is holding aperies of block parties in order to swell its Memorial Fund for defraying expenses covering military funerals and to assist in welfare work. George W. Welch, who served as a lieutenant In the World War, was re-elected commander of Greenpoint Post at an exciting election of officers of that organization on Monday. The other officers elected are: Lewis Rose, first vice-commander; Raymond JannuzzI, second vice-com­mander; Peter Plain, third vice-commander: Val Podwojuki, treasurer; John Lynch, sergeant-at-arms: Albert Cooper, adjutant Frederick Sturken, financial adjutant, Carsten Ludder, chaplain; John N. Johnston and Harry Juroe county delegates. Executive Board — William Knipe, Frank Dunn. Herman Springdale, Howard Gilmartin, George Nullet, Emil Del Campo. Anthony Falke, William Junger and Thomas Swarbrick. The officers will be installed on January 9, a social affair will follow. The post has named a committee to seek information concerning ex-service men’s families In Greenpoint needing assistance.